The 51 international scholars who visited the University of Chicago Law School last month came to the birthplace of law and economics to learn from the greats. 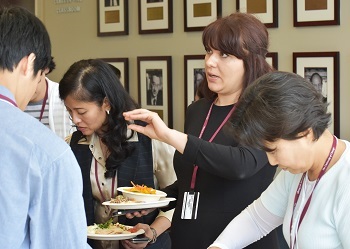 And so for two weeks at the fifth annual Summer Institute in Law and Economics, they listened to law-and-economics giants like Judge Richard Posner, who spoke about judicial behavior over lunch, and Professor Omri Ben-Shahar, who taught about the law and economics of consumer protection. They dug into the economic analysis of corporate law with Professor Todd Henderson, the law and economics of information with Professor Jonathan Masur, and empirical research methods with Professor William Hubbard. After class, conversations among participants and faculty often spilled into the hallways and continued over meals as the visiting scholars steeped in a swirl of ideas they described as invigorating, inspiring—and uniquely UChicago. “To get to understand this field and methodology and way of thinking about the law from the source is really enlightening,” she said of the Law School. But if history is any indication, Goanta’s Summer Institute experience is just beginning. Veteran participants describe the program as packing a powerful one-two punch: an immersive intellectual feast in Chicago followed by a stream of new, and often collaborative, opportunities for speaking and scholarly work around the world. Past participants have published papers on law and economics both in America and abroad, invited other participants and Law School faculty to speak at academic conferences in their home countries, and developed law-and-economics workshops and courses, all drawing on the knowledge and connections they nurtured in Chicago. “We see a cross-border collaboration—and one that really makes us appreciate even more the methodology of law and economics because even though the field was born in the United States, it can be applied to local issues in other countries,” said Ruoying Chen, ’05 LLM ’10 JSD, a Peking University Law School professor who has worked with Ben-Shahar on the program since it launched in 2012. Chen, for instance, spoke last year in Istanbul after a Turkish professor she met at the Summer Institute invited her to give a talk and teach a session in her class. It’s the kind of cooperation the Summer Institute was designed in part to inspire. 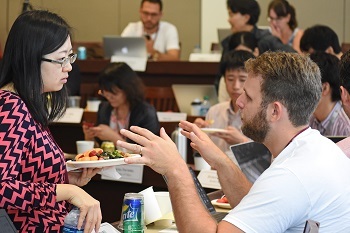 The two-week program, which drew participants from 17 countries this year, is part of Coase-Sandor’s mission to arm scholars around the world with the tools of law and economics, which can bring rational analysis to public policy. Despite a potential to improve market efficiency and avoid unintended results, the interdisciplinary field is still in its infancy in much of the world—though past participants have reported a growing interest in their home countries. 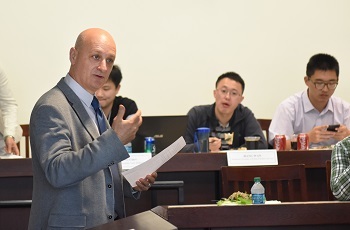 This year’s institute featured four units, each consisting of five two-hour lectures taught by Law School faculty, including Henderson, the Michael J. Marks Professor of Law and Mark Claster Mamolen Research Scholar; Masur, the John P. Wilson Professor of Law, David and Celia Hilliard Research Scholar, and Director of the Wachtell, Lipton, Rosen & Katz Program in Behavioral Law, Finance and Economics; Hubbard, Professor of Law and Ronald H. Coase Teaching Scholar; and Ben-Shahar. Participants also heard talks by a variety of speakers—including Richard L. Sandor, the Aaron Director Lecturer in Law and Economics and Chairman and CEO of Environmental Financial Products, and Martha Nussbaum, the Ernst Freund Distinguished Service Professor of Law and Ethics. At the end of the program, many of the participants were invited to present their own scholarly work and received feedback from Chicago faculty. Many of the scholars who attended the Summer Institute said they were drawn to the Law School’s culture—the willingness to question assumptions and consider an issue from many angles—in addition to its reputation. 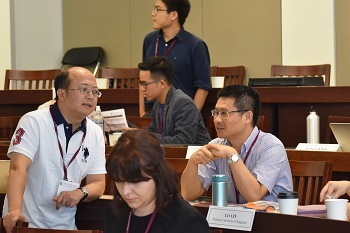 Supruet Thavornyutikarn, an economics professor at Thammasat University in Bangkok who attended his third Summer Institute this year, described the experience as an “intellectual rejuvenation” that ultimately inspired scholarly work. “Nobody ever says, ‘That idea is no good,’ they say, ‘Why don’t you try it this way?’ or ‘Why don’t you try it that way?’” Thavornyutikarn said. One paper he wrote used empirical law-and-economics analysis to examine the 2014 Thai military coup d’état and whether it was successful in combatting corruption; he concluded that the coup made corruption worse. Thavornyutikarn wasn’t the only one. Chen wrote a paper that was published in the Iowa Law Review last year, “Invited Takings: Supermajority, Assembly Surplus, and Local Public Finance,” that she said originated with a discussion in a Summer Institute property law class taught by Lee Fennell, the Max Pam Professor of Law and a Ronald H. Coase Research Scholar. Jón Gunnar Jónsson, the CEO of Icelandic State Financial Investments, who attended last year’s Summer Institute, is hoping to publish a comprehensive introductory law-and-economics article in a major Icelandic law journal later this year. And Claudia Cristofani, a federal appellate judge from Brazil who attended in 2015, said the knowledge she gained has inspired her opinions as a judge. “Now I have a broader view to guide my decisions,” she said. By the end of this year’s Institute, first-time participants were already thinking about how they, too, would apply the knowledge they gained in Chicago. Erik Wolkart, a federal judge in Brazil who attended this year’s Institute, said he, like Cristofani, is hoping to bring economic analysis to bear on issues facing the Brazilian judiciary. That could include using it to better implement his country’s new civil procedure code, which was adopted earlier this year, as well as to examine the efficiency of Brazilian litigation, which often drags on for many years. Xin Tang, a prominent professor at the Tsinghua University School of Law in Beijing who hopes to see law and economics gain greater traction in China, plans to incorporate some of the methodology into his research on comparative corporate governance and securities law and share what he has learned with his students.